Well sure makes me want to lick my lips like this sweet little guy...beautifully done!! Thanks for sharing with us at House Mouse and Friends!! Good luck! Fabulous plus! Love your wonderful coloring on this cute image Connie. I'm not a big fan of sweets but this could make me one in a hurry. Cute card. Such an adorable image and so love the cute mouse! Greetings from Florida, a couple of days left before I return home. What a gorgeous image NanaC! I could just eat that chocolate! Your sentiment makes me happy! I have to agree; if there's chocolate involved, it's a holiday!! I have to add, Molly is the cutest cat ever. Reminds me of my fav kitty I had years ago; just can't beat a grey tiger! hee hee hee ... I couldn't agree more with the sentiment. Fabulous card, Nana Connie! Love the CAS look to it and those ribbons and bows are such a sweet touch. 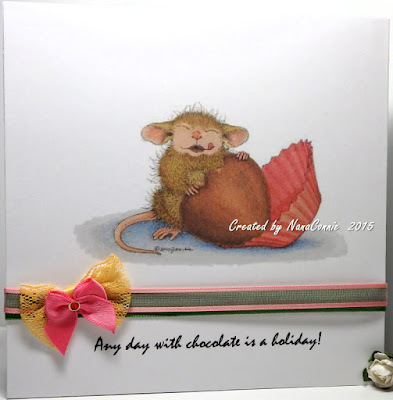 ​Thanks for joining us at House Mouse and Friends Monday Challenge. Hope to see you again on the next challenge! This is so darling, your coloring is incredible and those tiny bows are super sweet. Nana Connie the coloring of the image is awesome! Love your ribbons and bow. Great CAS card! Oh, yum, NC, your card is so sweet. A delicious piece of art! Thanks for joining us at the Path of Positivity this month! This is a perfect card for our Holiday challenge...makes me want a piece of chocolate myself. Adore the CAS design and lovely coloring! LOL!! He makes me smile!! :) Love your fun CAS design here!! Love it! ​Thanks for joining us at Sister Act Card Challenge. Hope to see you again on the next challenge! Yummy, super cute card! Great job with colours and the dubble bow looks so cool! Thank you for playing along with our CAS challenge this week. Good luck! Love this. 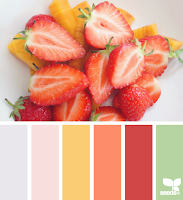 Awesome coloring, HM image and sentiment! Really cute card, love the image and the simple style you chose. Thanks for joining us for the House Mouse and Friends Monday Challenge. Beautiful. Thanks so much for joining us at the Art by Mi Ran Challenge Blog. An adorable cute card Connie, I love the CAS style and beautifully colour cute image with lovely details!! This cute guy is having so much fun with his chocolate, sweet take on the Holiday chall theme. Thanks for sharing with us at House Mouse & friends Mon. chall.. hope to see you again soon. Oh yum, yum - chocolate!!! <3 Very sweet card! Lol, chocolate definitely spells happiness. This is so perfect for our HAPPINESS theme this month. Thanks for sharing your talent with us and good luck.